The North end of Main Street, Alachua in 2017. Locals poured into Popovers on Main at 11:37 a.m. The just-opened café went from having one table occupied to a full house within five minutes. Fall leaves, pumpkins and baskets lined all four walls, giving the impression that this little shop was picked up from the Adirondacks at the peak of fall and placed in the small Florida town of Alachua. 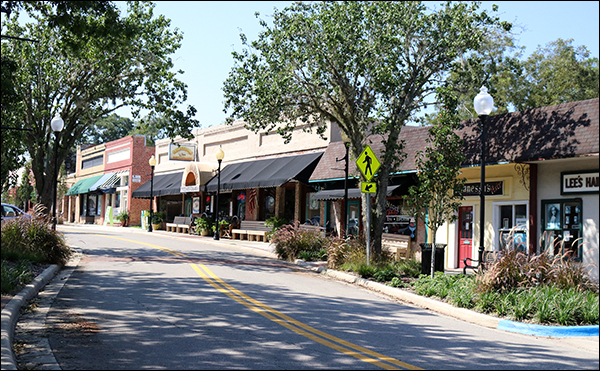 Side by side, small businesses like hair salons, restaurants, clothing stores, quilt shops and cafés line Alachua’s Main Street. The town itself is home to minimal chains of any sort, so the amalgamation of small businesses creates a very unique, friendly neighborhood atmosphere. 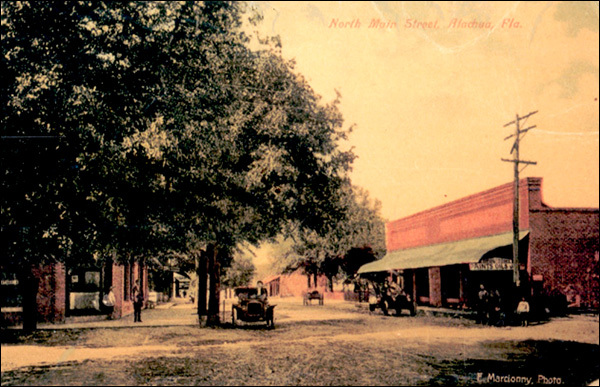 The North end of Main Street, Alachua at the turn of the century (photo courtesy of the Matheson Museum). 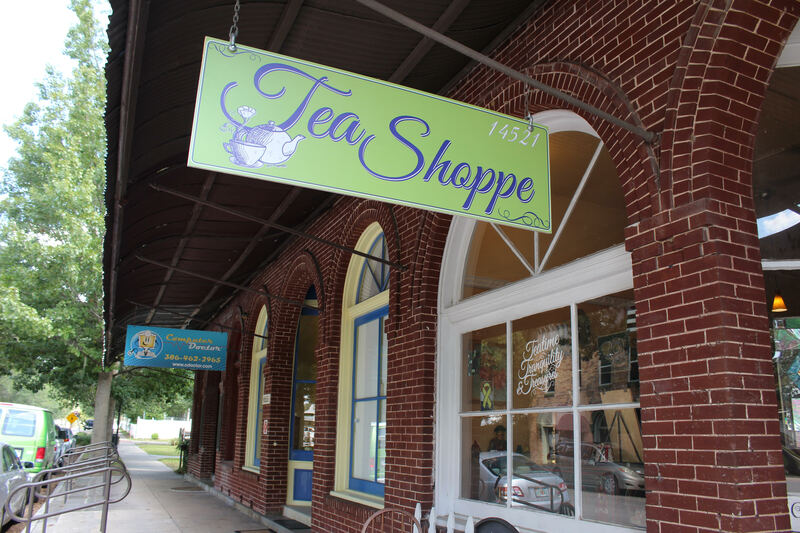 The businesses that define the old-town charm of Alachua’s historic downtown area depend on a long-awaited revitalization plan launched by the city in 2015. 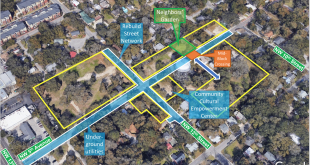 Alachua’s Community Redevelopment Agency hired Redevelopment Management Associates, a consulting company that revitalizes towns throughout Florida, to improve the downtown area. And in July 2016, after six months of research, the company presented their report to renew and expand the historic downtown and surrounding areas. Small shops line Downtown Alachua’s Main Street. 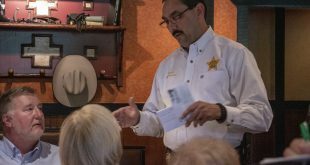 The plan included marketing ideas, outreach programs, branding strategies and businesses to attract. 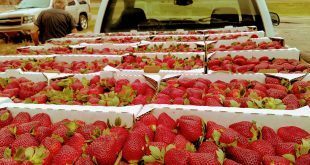 The city government approved the plan, and city officials are working with locals and the CRA to implement it. In an effort to continue to develop and grow the local businesses in the area, the City of Alachua’s Community Redevelopment Agency (CRA) sets aside a certain percentage of city and county property tax and reinvests it into redeveloping an area that’s in need of improvement, said Chelsea Bakaitis, the CRA Coordinator in Alachua. Main Street used to be a thriving city center, but once the effects of the economic recession became apparent to local businesses, the city knew it was time to act, said Boukari. “That’s what prompted the city to say, ‘Hey, we need see if we can get a plan revitalize Main Street’,” he said. The city government and locals have agreed that changes must be made to restore Main Street, but the execution of these changes is still being determined. From a quilt shop to a music store to a restaurant, all will be impacted by the steps the CRA will evenutally take. Boukari and CRA coordinator Chelsea Bakaitis oversee project developments along with a CRA advisory board, city commissioners and the city manager. Julie’s Pins and Needles, at 14911 Main St, Alachua, Florida. The city presented RMA’s plan over a year ago, and with little physical evidence of progress, some business owners are growing restless. Kelly Harris, owner of Kelly’s Kreations on Main Street and the vice president of the Alachua Business League, an organization that focuses on local business-to-business support, said that the city of Alachua was once as small as 2,000 people. “As it has grown over time, so too has the amount of businesses in the area,” she said. 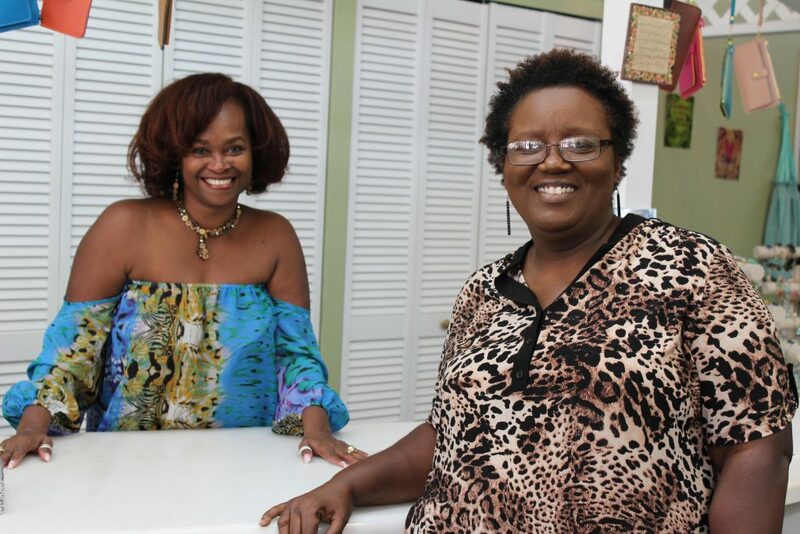 Partners Sondra Thirston (left) and Virginia Lynn (right) pose alongside each other in The Good Life Market Place, where multiple business owners set up shop and host events. The CRA Advisory Board voted on a grant program recently that will give a bit of money to the business to fix up the outside of their stores without having to spend their personal money doing so, the coordinator said. 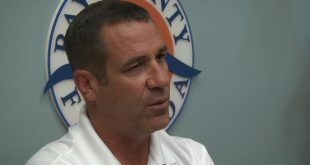 Harris said the reason small businesses in Alachua struggle at times is because the locals don’t realize that a lot of the businesses in the area provide everything the people would need. Julie Tucker’s retirement depends on the decisions of the CRA. After retiring from her first career, Tucker launched her own Main Street business in six weeks. “No point in dilly-dallying,” she said. The Ohio native moved to High Springs in 2009. 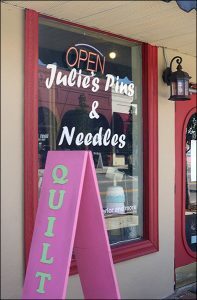 Her shop, Julie’s Pins and Needles at 14911 Main St, Alachua, opened in 2014 and is one of the newer businesses on Main Street. That hasn’t stopped it from becoming a staple for local quilters. In her shop, Tucker is constantly multitasking – cutting cloths, ironing material, and finishing stitches while hurrying around bolts of fabric. But when a customer asks for help, Tucker gives her complete attention. “We take care of each other, and that’s part of what I like about Main Street. It’s a town full of good people,” said Julie Tucker, the owner of “Julie’s Pins and Needles”. Tucker aimed to make her store a welcoming environment with cushy chairs, fabric samples, and her two-year-old mutt, Scruffy, around the shop. That, along with with the classes and workshops she hosts, helped realize her dream for the store. 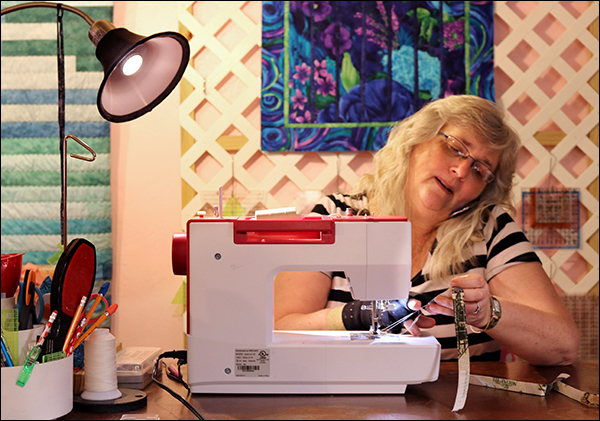 “I wanted it to be a place where quilters can come, work on their projects and enjoy each other’s company,” she said. Tucker hasn’t waited for the city to help her. 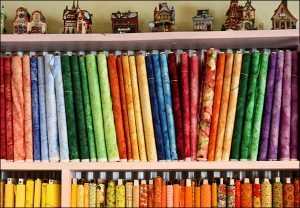 To increase business, Tucker participates in quilting bus tours, where enthusiasts from around the world visit quilt shops. Tucker’s shop sells fabric, sewing supplies and offers classes. “My hope is it’ll not only bring me business, but will support my other businesses on Main Street,” she said. Tucker said the shop is still a work in progress, but she’s happy. She points to the community spirit of businesses that look out for each other. Whether it’s alerting others of security issues or welcoming a new business to the neighborhood, the community is close. Along with everything the CRA is doing to promote the businesses, some store owners feel like there could be a little more done with signage. Stroud said that making the signs bigger would help promote businesses further. 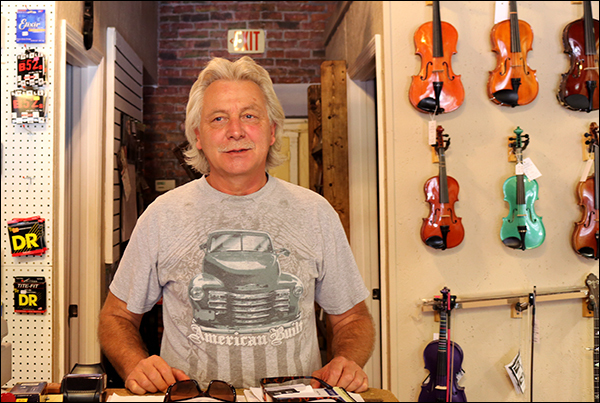 New businesses aren’t the only ones invested in Main Street’s future. Seasoned business owners such as Rick Robertson are actively involved in the community. 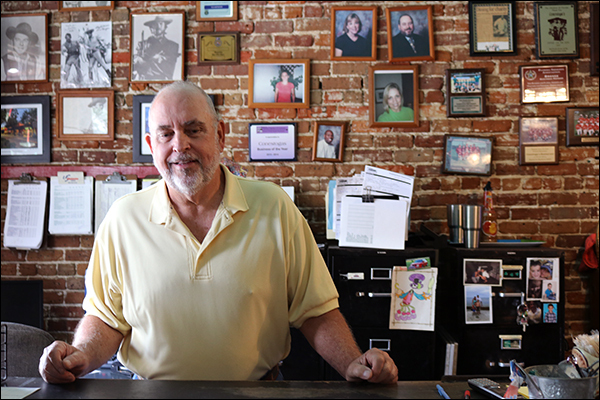 Robertson moved to Gainesville in 1977 but didn’t open his restaurant, now at 14920 N. Main St, Alachua, for another 11 years. 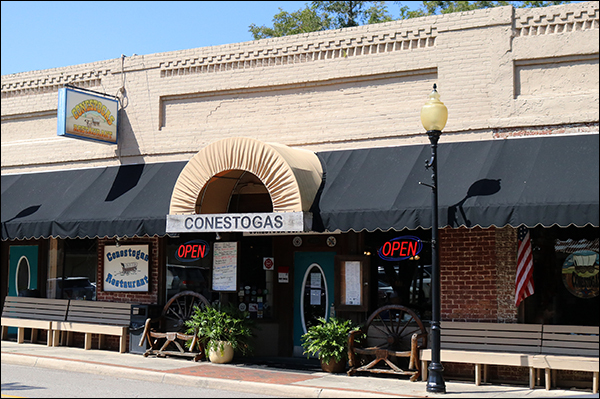 His restaurant, Conestogas Restaurant, celebrated its 29th anniversary on Main Street this month and is one of the longest-running businesses in historic downtown. “You’ve just got to make people feel like family,” Rick Robertson, Conestogas Restaurant. Robertson is a member of the CRA advisory board and said the $50,000 the CRA paid for RMA’s contract wasn’t necessary. “They made a couple of good suggestions, but we could’ve done the same thing,” Robertson said. He agrees with their plans for advertisements, which is a topic he said he’s advocated for since he opened his restaurant. Conestogas Restaurant at 14920 N. Main St, Alachua, Florida. Robertson has been through a lot with this town. He was there when the CRA first formed in 1989 and when curves were put in the road to slow traffic and encourage pedestrians. He remembers handwriting checks for his employees and buying the business’ first computer. Robertson said for his restaurant, service ranks above everything else. “You’ve just got to make people feel like family,” he said. Robertson talks with regular customers Jason and Michelle Powell. “Everything is made to order and is done right,” Jason said. Growing up, Robertson said a big night out for his family was going to McDonald’s. 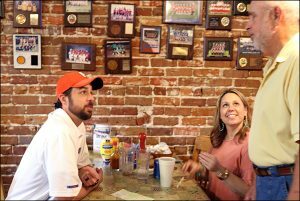 Now, his restaurant is a favorite to families across the area, including customers Jason and Michelle Powell. “Everything is made to order and is done right,” Jason said. Leon Barrows, owner of Music Junction, echoes the need for more activity and growth in the historic downtown. “We need to bring Main Street back alive,” he said. Barrows said when he first moved to the area, festivals and community events were a regular part of the weekends. Now local business owners who sponsored the events have either retired or can’t afford to be involved. String instruments hang on every wall in Music Junction at 14856 Main St, Alachua. Barrows says that the store has a good mix of new and returning customers. He retired from New York to High Springs in 2007 and opened his instrument repair store there. In 2012, he and his business moved to Alachua. 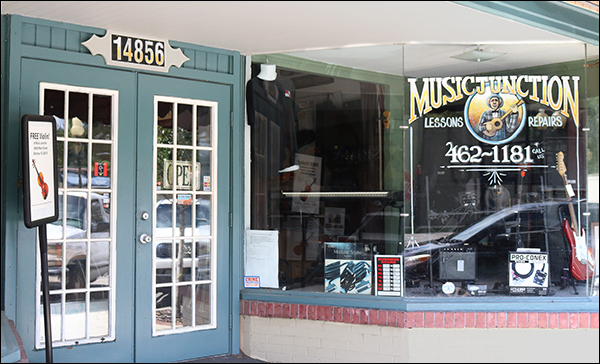 Music Junction, at 14856 Main St, Alachua, Florida. 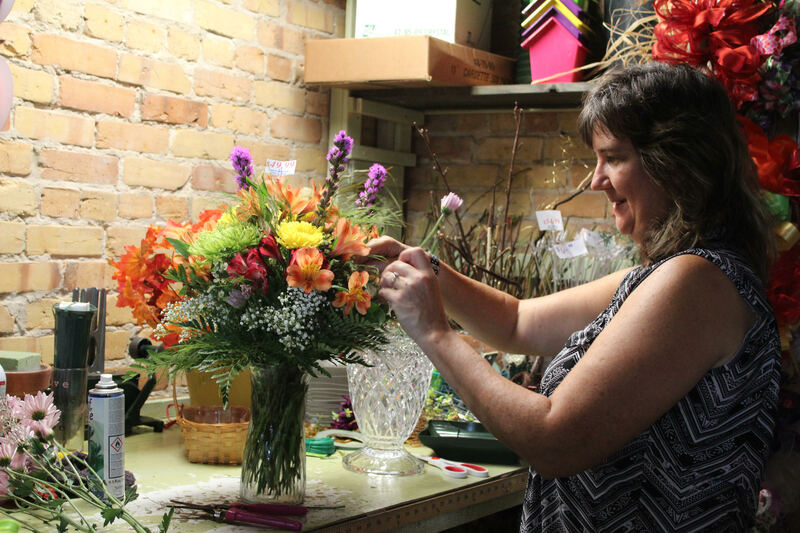 Virginia Lynn, owner of The Good Life Market Place, a place where multiple business owners reside, emphasized that survival of the small business comes down to collaborating with each other. The CRA’s proposed budget for the next fiscal year, which begins Oct. 1, plans to spend $779,721 to redevelop the area. $65,000 is allocated for directional signs in downtown and $30,000 for other marketing. CRA coordinator Bakaitis said the next 12 months will focus on marketing, planning events, advertising, and establishing a facade grant program and a business retention and attraction program. 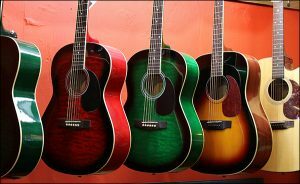 Guitars hang on the wall of the store, which Barrows said specializes in string instruments. Alachua’s assistant city manager said he understands locals’ frustration with the project’s pace. “They want it done,” Boukari said. Boukari said this planning period is necessary. The city could’ve immediately gone ahead with the project without involving business owners, but he said that would be unfair. Ultimately, business owners like Tucker said it’s all about more people experiencing downtown Alachua. “I hope that people will see the gem that we have here,” Tucker said. Christy Piña is a reporter for WUFT. She can be reached at cpina95@ufl.edu or (786) 553-4281. Follow her on Twitter @christypina_.